Project X Zone 2 may have slipped into an early 2016 release in the West, but there's exciting news that should help build more interest among Nintendo fans. Characters from Nintendo-exclusive games are joining the diverse cast which already encompasses Bandai Namco, SEGA and Capcom IPs. The two games / franchises being brought in are Xenoblade Chronicles and Fire Emblem. The former makes sense in terms of Monolith Soft's involvement as developers of the first game and this sequel, while the latter is a neat curveball that nevertheless makes sense considering the close ties between Nintendo and Bandai Namco, in particular. The Xenoblade character will be Fiora, who will be partnered with KOS-MOS from the Xenosaga series. Then we have Lucina and Chrom from Fire Emblem, below. Are you excited about these new characters, and does this boost your interest in the game? Let us know in the comments. The first seemed alright (I played the demo) and this announcement has got me interested. I'll keep an eye on it. Tried the demo of the first game and couldn't really get into it...so, I dunno. Can't really buy anything until next year anyways, I think. Would love to see Pit and Palutena join in as well! Chrom and Lucina may be more well-known in this generation but I'd rather see Lyn and Eliwood. No Marth! No Roy! Ike is ok, too. This just peaked my interest. I'd be astonished if this didn't have amiibo connectivity. Fire Emblem characters are a neat addition. I wonder if these are the only ones they're including. @ollietaro But Marth and Roy are, like, THE Fire Emblem duo everyone grew up with. Hey, I was already going to buy this game. Still hope they fix the problems in the 1st game though. I kind of question what kind of funny conversations Lucina can get into if Chrom is with her all the time. Chun-Li was a constant buzz kill to Morrigan. Loved the first game. This sequel will definitely be added to my collection. Nice to see Nintendo IP jumping in on this ultimate crossover game. When I first looked at the screenshot, I noticed that Chrom looks a bit off aesthetically. Don't get me wrong, I love Chrom but I feel that for the art direction behind him in this, it looks a bit off compared to Awakening. That said, I'm curious how this turns out. haven't played the first one. I'm also curious as to what the game is all about. Project X Zone has awesome sprites. 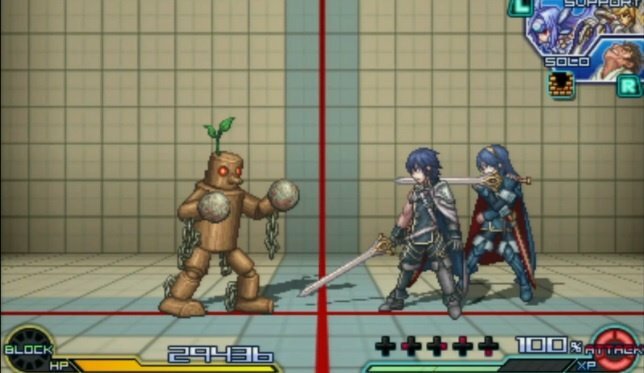 I'll finally have Chrom and Lucina bead sprites on my wall. This game sure does have an all star cast. I haven't played the first one, but I do like Tactical RPGs and since this game does seem to be Crossover Heaven, I'll definitely, at the very least, look into it. @DarthNocturnal did the trailer say these were the only guest characters? I'm not expecting a ton more but lack of shulk surprises me too. Here's hoping for Shulk time! Monolith Soft worked on Xenoblade and Xenosaga. Not only that, but the fact that "spoiler Fiora" gets paired up with KOS-MOS due to both being mechanical just make even more sense as a pair. Maybe they would've rather leave Shulk as a support we don't know about yet, it's more logical that way. me: Well, it looks neat and all, but I don't know if it simply being a crossover brawler is enough for me. me: Where can I preorder? it was announced in the morning(i live in the uk) but all that aside it is very cool BUT WHERE IS SONIC!? Sega put sonic and any one of his friends into Project X Zone 2! HE IS ONE OF YOUR FAMOUS MASCOT SEGA! Meh...Fiora might just be my least favorite (main) character in an RPG since that bore Van (FFXXII). I don't hate her, and I admit that that pairing makes sense, but I feel like there's wasted potential somewhere in there. Awesome to see Chrom, tho. Yes!! Nintendo has answered my prayers! Maybe we'll see some more Xenoblade characters like Shulk, he'd fit perfectly. Hopefully we'll see other franchise reps, but unfortunately since this game is dialogue-heavy we probably won't see Link, Zelda, Samus, etc. I would have loved to see Little Mac teaming up with Ryu and Ken. Also, this makes me even more bitter that Sakurai couldn't have made Lucina or Chrom unique in Smash like they did here. And again guys, relax, you just aren't going to see Sonic in this game. They only use human-like characters. @Tsurii yo what's your beefwith fiora? Now this I like, this mean my Lucina and Ryu Amiibo won't go to waste. Add Samus and (human form) Midna, as a team and I'd buy this game twice. Seeing as though I've already paid for this game in full. @Squadallama well, between the shoehorned romantic subplot towards the end of the game and the story trying to force me to feel bad for her at a point in the story when I barely care about Fiora she's just a boring character. She's pretty much just there to give Shulk a motivation for his journey. The only thing Fiora has going for her is the whole thing with Meyneth, but I'd argue she's more of her own character (and I actually really like Meyneth) than part of Fiora. Again, I don't hate her, but I'm not particularly fond of her either. She's just "there"
@the101 Its not really a brawler though. Those combos you see are automated, you basically just initiate them via button combo (direktion+button). The trick is, to experiment with the timing when to start the next chain of attacks to keep your enemy juggling. The longtime FE fan in me wants to complain about the series only getting Awakening representation... But this honestly just looks too cool! Also, go Seven! You rock! So happy to see Fiora (my smash ballot choice) get more love! @Tsurii What shoehorned romantic subplot? Their romance was there from the very beginning of the game. Lucina is a decent character but Chrom stinks. @DEAD They seem to be sticking with the more human anime-like characters as opposed to cartoony ones like Sonic, hence why there's no Pacman or even Classic Megaman, instead going with the more serious and less toony X franchise. That said, I'm PRAYING for some Skies of Arcadia characters but with this opening up Nintendo character to the mix, I'd like to see characters from Kid Icaus, more from Xenoblade, and maybe Zelda? Talkless Link would be tricky, unless it was like Hyrule Warriors where a Fairy spoke on his behalf, but others like Zelda, Shiek, Gannon, etc could be more then possible. The video is too intense for my browser to handle! I can understand the inclusion of Xenoblade Chronicles characters since Namco Bandai owns them, but Fire Emblem feels a little out of place since they're full Nintendo characters (though compared to other characters in Project X Zone it's highly understandable). Here's hoping for a Link and Zelda (and Navi) duo and maybe Ike and Robin (even though they'll probably use the female version). I've always thought a game like this with Nintendo characters would be awesome. Hopefully these aren't the only 3. @TheRavingTimes namco I owns xenosaga. Xenoblade is Nintendo owned. I'm what'ing all over the place. In a good way. I didn't say anything about why Xenoblade Chronicles characters were there in the first place, or Fiora's similarities to KOS-MOS. I only found it odd that Shulk isn't included (unless he is, which is very possible). Day one buy. Loved the first game. Yes it did tend to drag on at times, but mostly because I really wanted to make sure my team leveled up evenly. @TheRavingTimes Ike would be solo or paired with someone from his own two games like Soren or Ranulf. Link and Mario tag team ftw! Can't lie, I might play this game now. What an evil practice. They are playing us like little puppets. Has anyone seen my wallet? Decided to check that trailer. Can't help but feel there's some spoilers to this character, considering the opening hour or so of the game I've played so far. I owe it to myself to get XC played, like, yesterday. I have no interest in Project X Zone 2. I may scoop it in the bargain bin just because I own the first, but that's about it. Since the first game was kinda meh, and I don't see anything that improves the combat approach, no. Not at all. These characters make no difference to the second game, and the first one became really bad around the second half. However the next thing that needs to happen is Nintendo Vs Capcom Vs Bandai Namco vs Sega. Come on Capcom, Marvel is probably not coming back to anything outside Infinity so why not make an All Star Japanese Vs fighting game. I already had this game preordered because I enjoyed the first one. I can't wait for this one. When is this coming out? I am super excited about this game. Just Fiora? Oh well, 1 Xenoblade character is better than no Xenoblade characters, especially since Fiora's awesome anyways. Would you consider the first worth the $20 they're asking on the eShop? Seems retail copies in Canada are scarce-ish (but just as cheap... as long as you're not buying from 3rd party retailers on Amazon), so eShop may be my only easy option. It'll be nice if Namco ported some of the Xebosaga games to the 3DS, considering that Xenoblade Chronicles X is a sort of spiritual successor to Xenogears and Xenosaga (let's not forget that the original Xenoblade Chronicles X logo had the same X that's in Xenogears logo). Honestly, I'd say no. You can find the physical version for half that price now. Unless you are a digital only person. Awesome! Now this makes me want to buy the game even more. Hopefully they fix the faults of the first game in this, making it less repetitive and more engaging, and it would be a must buy for me! If more Nintendo characters do somehow make it in, I would love for a Golden Sun pair to be included. Isaac/Garet (the earth/fire bros.) or Isaac/Felix (the earth bros. in law) or even Isaac/Jenna (the rocking fiery couple) would definitely lend well to the style and gameplay of the franchise. Since a lot of the franchises in the game are niche, I don't see why a fairly popular Nintendo RPG can't be represented IF Nintendo does let them add more of their characters. Still interested in the game though. Okay, that's pretty cool. I was afraid they'd lock it behind amiibo or something. Was getting it before so BONUS! I prefer new copies (well, if they're from the current generation/ late previous generation) if I can help it. Sadly, Amazon.ca third party sellers are price gouging (new, and even used), and apparently EB Games only has used. So, aside from any loose new copies that could be anywhere, digital seems to be the easiest way to score a "new" copy. I still lean towards physical copies for consoles/ handhelds, but I'll go digital if I need to. This is cool to hear/read, but of all characters from Xenoblade Chronicles why Fiora? You'd think Shulk would've been chosen along with KOS-MOS. @maukenboost Honestly, Shulk is probably the lamest character in Xenoblade.There, I said it. I have the first game in backlog. Picked it up cheap earlier this year. I suppose I will have to give it a try to see how it plays before this sequel launches.